No. 20, Jalan Taming 5, Taman Taming Jaya, Off Jalan Balakong, 43300 Seri Kembangan, Selangor, Malaysia. 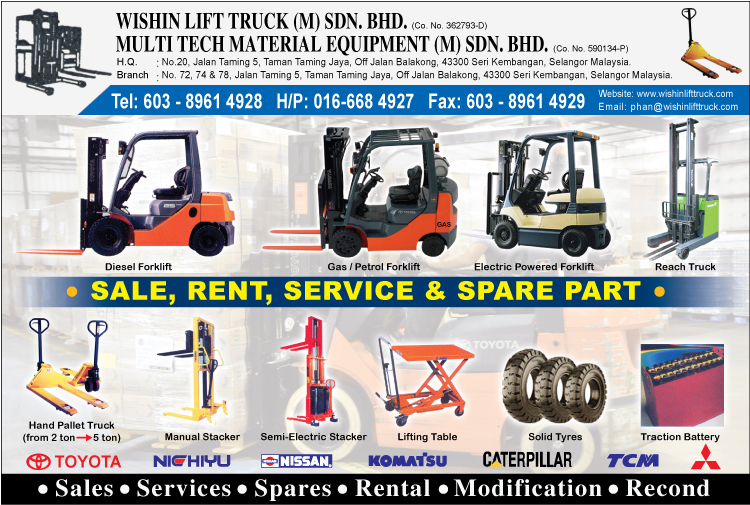 We are Malaysia forklift supplier and forklift spare part supplier that provide reconditioned forklifts, stackers and reach trucks, electric reach trucks, hand pallet trucks and many more. Apart from that, we also repair and provide services for forklifts, reach trucks and many more. We belief that Lift Trucks should be designed to be of a rugged and practical design as well as being easy to maintain and service. For supply to the Asian region, this design also takes into account the smaller size of many Asian operators.